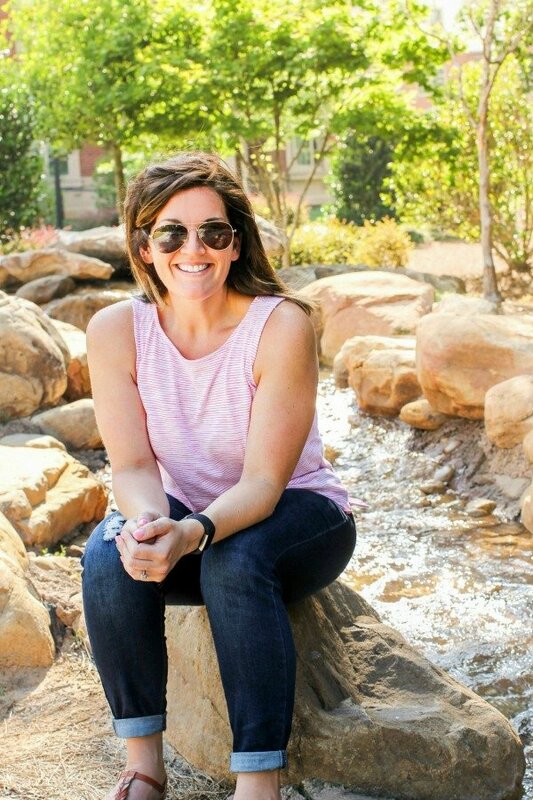 October 10, 2017 By Allyson 17 Comments This post may contain affiliate links. Read my disclosure policy. 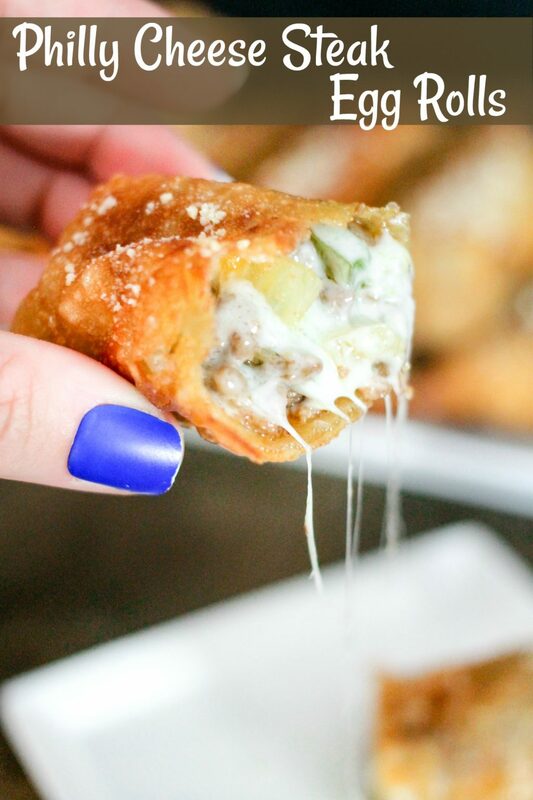 Philly Cheese Steak Egg Rolls are a fun spin on America’s favorite sandwich! Beef, cheese, peppers, and onions wrapped into the perfect party snack! I’ve been on somewhat of an egg roll kick lately, so I was brainstorming ideas on what I could pack into a delicious crispy egg roll wrapper. Well, it was no surprise when I thought about a Philly Cheese Steak Egg Rolls version, because the Philly Cheese Steak is one of the most popular sandwiches! Of course it would be delicious! Be sure to checkout my popular Spinach Artichoke Egg Rolls, Bang Bang Shrimp Egg Rolls, and Turkey Club Egg Rolls! 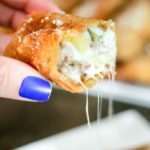 This Philly Cheese Steak Egg Roll recipe is actually VERY simple, and you only need a handful of ingredients! You need to cook up the meat and veggies in a skillet, then add a simple sauce base and the cheese – done! Then you just place some of the mixture into the center of the egg roll wrapper and roll it up! Give it a quick fry and boom, you are done! Scroll down to see a step by step video on how to make them yourself! 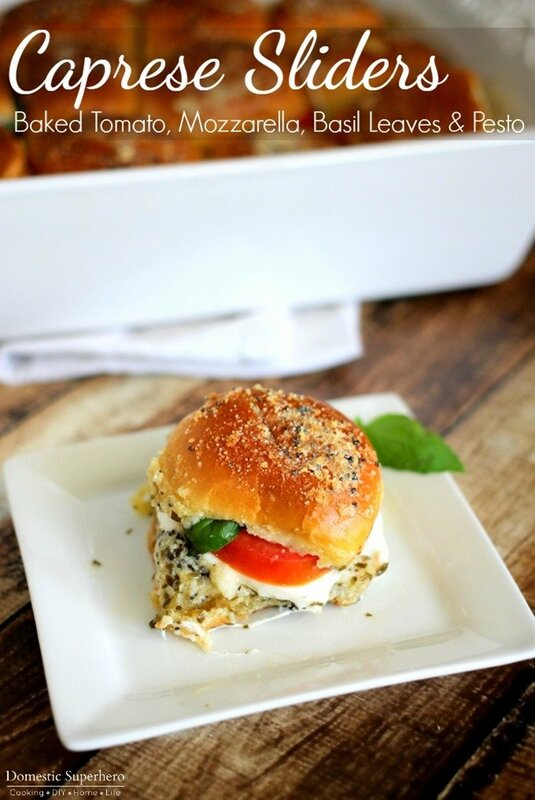 Don’t forget to PIN this recipe to SAVE FOR LATER! 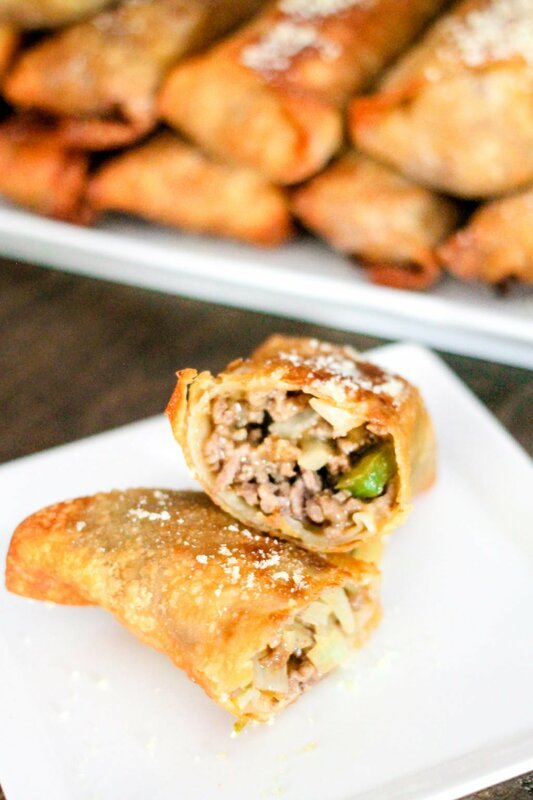 Philly Cheese Steak Egg Rolls are a fun spin on America's favorite sandwich! Beef, cheese, peppers, and onions wrapped into the party snack! In a large skillet, add beef and let cook for 4-5 minutes before breaking apart. Slowly break apart and continue to cook until mostly cooked through. Remove from pan and drain off fat/grease; set aside. Add butter to skillet and melt. Add onions and green peppers and cook for 3-4 minutes. Add beef back to skillet and combine; cook 2-3 minutes. In a small bowl add broth, ketchup, Worcestershire sauce, salt, pepper, and cornstarch; mix until combined. Add to skillet over medium heat; stir. Add cheese and continue to stir until the cheese is melted. Remove from heat. Using one egg roll wrapper at a time, add about 3 TBS of the filling to the center of the wrapper. Dip your finger in the water and run along all edged of the wrapper (see video). Fold the egg roll up carefully, taking care to press along the seams to seal the egg rolls. Repeat until filling is all used. In a frying skillet/pot, add oil and heat over medium for about 5 minutes. Carefully drop egg rolls into the skillet, cooking 4-5 at a time, not crowding them. Cook 2-3 minutes per side, until golden brown, then carefully flip over and cook another 2 minutes or until browned. Remove and place on a paper towel lined plate. Repeat for all egg rolls. Garnish with parmesan cheese and serve immediately. Enjoy! Don’t forget to check out Sabrina’s Philly Cheese Steak Sloppy Joes, which inspired the filling for these philly cheese steak egg rolls! We love the sandwiches, so I KNOW we will flip over these. Can’t wait to try these on game day. I’m such a sucker for unconventional egg rolls! 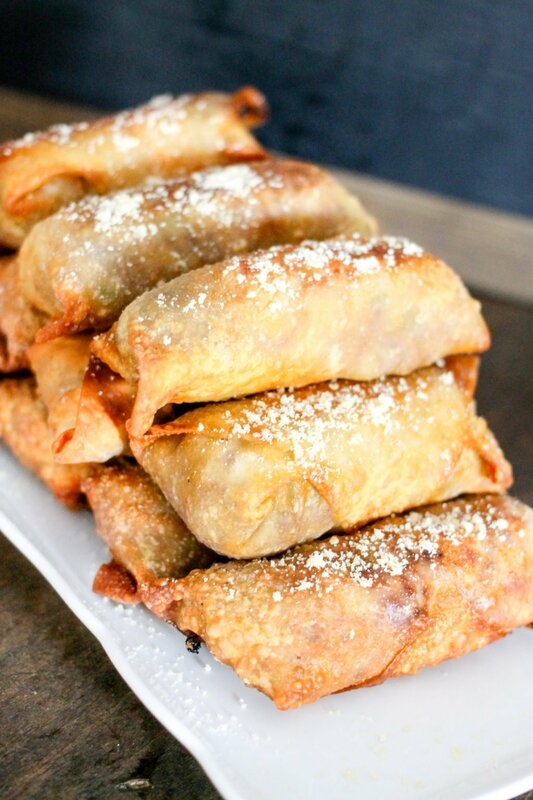 Everything is better in egg roll form! 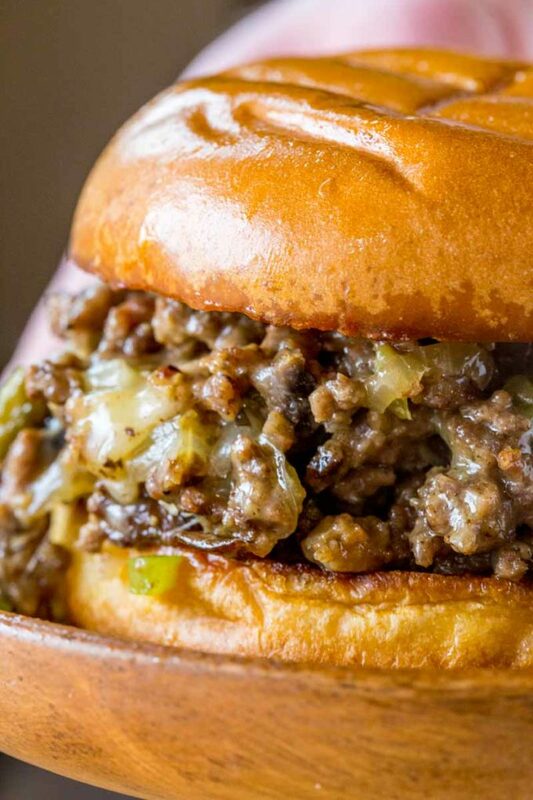 What a great spin on an American classic! These look amazing! This is the ultimate appetizer! 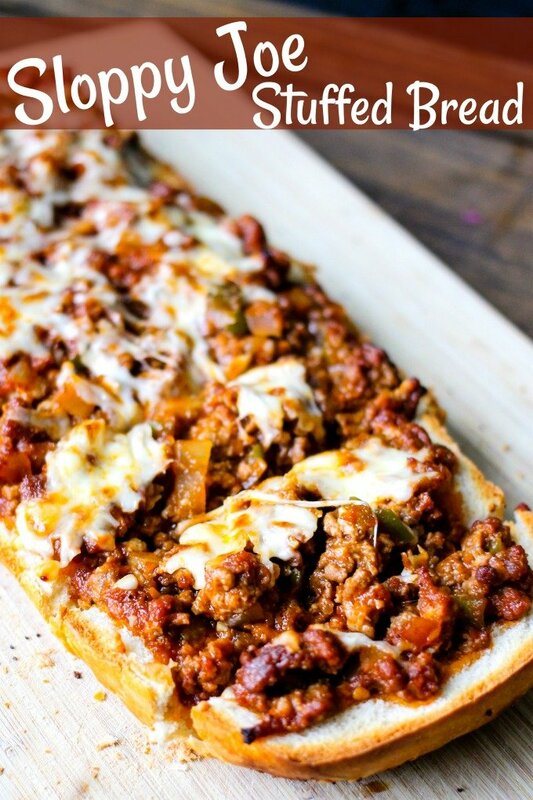 I am totally making this for dinner tonight! Wow, these would be great for a party! I am going to try this for dinner! 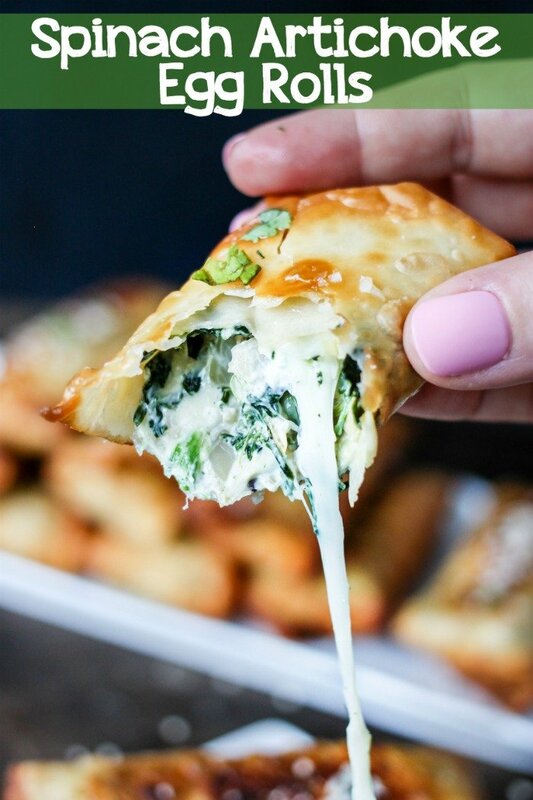 These would make great game day snacks! Oh boy…the ultimate party appetizer. This will fly at my house. My Hubby will devour these egg rolls! Yum! Oh my heavens! These look SO SO good! Do u think a person could make them & freeze them for a later date. Have u tried it? Rosemary, I haven’t tried it. I think if you did, you might want to try doing the whole recipe, freezing and then baking to defrost. I THINK it would work, but I haven’t tried it so I cant be sure. If you try, please let me know!